At University of Washington Medical Center, Dr. Jay Rubinstein (left) and Dr. Jennifer Hsia implant a vestibular device for correcting a balance disorder. 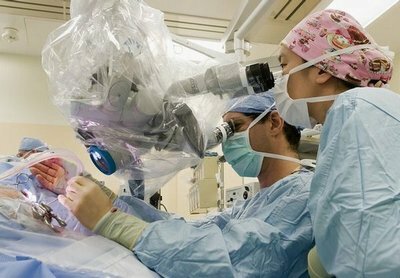 For the delicate operation they use a surgical microscope that allows them both a clear, magnified view of the surgical field. 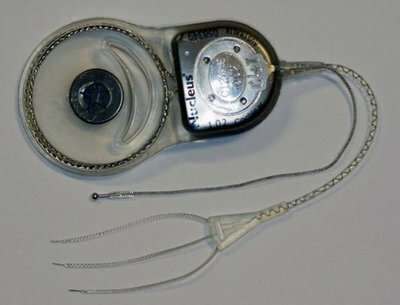 The device being tested for treating the vertigo of Meniere’s disease is a cochlear implant and processor with re-engineered software and electrode arrays. On Oct. 21 a University of Washington Medical Center patient became the world’s first recipient of a device that aims to quell the disabling vertigo associated with Meniere’s disease. The UW Medicine clinicians who developed the implantable device hope that success in a 10-person surgical trial of Meniere’s patients will lead to exploration of its usefulness against other common balance disorders that torment millions of people worldwide. The device being tested — a cochlear implant and processor with re-engineered software and electrode arrays — represents four-plus years of work by Drs. Jay T. Rubinstein and James O. Phillips of UW’s Department of Otolaryngology-Head and Neck Surgery. They worked with Drs. Steven Bierer, Albert Fuchs, Chris Kaneko, Leo Ling and Kaibao Nie, UW specialists in signal processing, brainstem physiology and vestibular neural coding. Rubinstein is also a UW professor of bioengineering. “What we’re proposing here is a potentially safer and more effective therapy than exists now,” said Rubinstein, an ear surgeon and auditory scientist who has earned a doctoral degree in bioengineering and who holds multiple U.S. patents. The disease affects hearing and balance with varying intensity and frequency but can be extremely debilitating. Its episodic attacks are thought to stem from the rupture of an inner-ear membrane. Endolymphatic fluid leaks out of the vestibular system, causing havoc to the brain’s perception of balance. To stave off nausea, afflicted people must lie still, typically for several hours and sometimes up to half a day while the membrane self-repairs and equilibrium is restored, said Phillips, a UW research associate professor and director of the UW Dizziness and Balance Center. Because the attacks come with scant warning, a Meniere’s diagnosis can cause people to change careers and curb their lifestyles. Many patients respond to first-line treatments of medication and changes to diet and activity. When those therapies fail to reduce the rate of attacks, surgery is often an effective option but it typically is ablative (destructive) in nature. In essence, the patient sacrifices function in the affected ear to halt the vertigo — akin to a pilot who shuts down an erratic engine during flight. 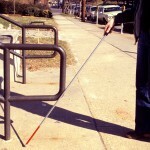 Forever after, the person’s balance and, often, hearing are based on one ear’s function. A National Institutes of Health grant funded the development of the device and its initial testing at the Washington National Primate Research Center. The promising results from those tests led the U.S. Food and Drug Administration, in June, to approve the device and the proposed surgical implantation procedure. Shortly thereafter, the limited surgical trial in humans won approval from the Western Institutional Review Board, an independent body charged with protecting the safety of research subjects. By basing their invention on cochlear implants whose design and surgical implantation were already FDA-approved, Phillips and Rubinstein leapfrogged scientists at other institutions who had begun years earlier but chosen to develop novel prototypes. “If you started from scratch, in a circumstance like this where no one has ever treated a vestibular disorder with a device, it probably would take 10 years to develop such a device,” Rubinstein said. The device epitomizes the translational advancements pursued at UW’s academic medical centers, he said. He credited the team’s skills and its access to the primate center, whose labs facilitated the quick turnaround of results that helped win the FDA’s support. A successful human trial could lead the implant to become the first-choice surgical intervention for Meniere’s patients, Phillips said, and spark collaboration with other researchers who are studying more widespread balance disorders. The first patient to receive the device is a 56-year-old man from Yakima, Wash. Gene Pugnetti has unilateral Meniere’s disease and has been a patient of Rubinstein’s for about two years. Cochlear Ltd. of Lane Cove, Australia, will manufacture the device. Cochlear is a medical equipment company and longtime maker of devices for hearing-impaired people.